Several hundred protesters affiliated with the Occupy Wall Street movement converged on the West Lawn of the Capitol Tuesday to decry the influence of corporate money in politics and voice myriad other grievances. "I'm encouraged," said Jon Wynn, 63, of Snow Camp, N.C., who traveled to Washington to attend the protest and visit friends. "There's energy here, even if there's not a whole lot of people." The protest comes amid numerous polls that show 84 percent of Americans disapprove of the job Congress is doing, near an all-time low. While the rally was mostly peaceful, there were some scuffles between police and protesters along walkways leading to the Capitol. By mid-afternoon Tuesday, four people had been arrested  U.S. Capitol Police said  one for allegedly assaulting a police officer and three accused of crossing a police line. The Occupy movement includes activists who want to change government from within and anarchists who oppose all government. Tension between the two camps was evident at Tuesday's gathering, where some taunted police while others participated in earnest group discussions about how to influence their elected representatives. Anne Filson, 71, a retired teacher from Madison, N.H., said she was disappointed by the turnout and said Occupy protesters needed to stick to their core message of narrowing the gap between rich and poor. Protesters did not help the cause by carrying profane signs and antagonizing police, she said. "What I regret about some of the Occupy movements is the dilution of the message," Filson said. "A lot of Occupy people have to realize that they're being counterproductive." Later Tuesday, small groups of protesters entered House office buildings in a bid to meet with individual members of Congress. Participants also planned to march to the Supreme Court and the White House. 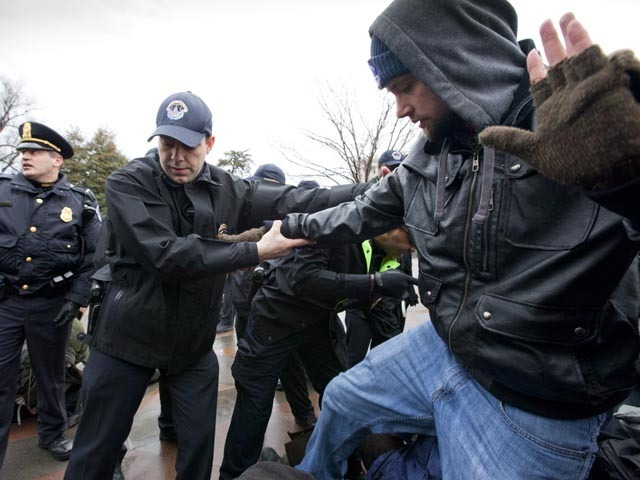 It was not clear whether the out-of-town protesters would swell the ranks of the two Occupy encampments in Washington. Late Tuesday, a House oversight subcommittee announced that it would hold a hearing next week on why the protesters have been allowed to remain in McPherson Square  which city officials say is infested with rats  despite a ban on camping on park service property. Protesters Rachel Marcotte and Taft Clark, 23, planned to return to their tent at Occupy New Haven in Connecticut, which has been compromised by snow. "We're told that it's still up, but it's not looking good," Clark said. "We have some work to do when we get back."